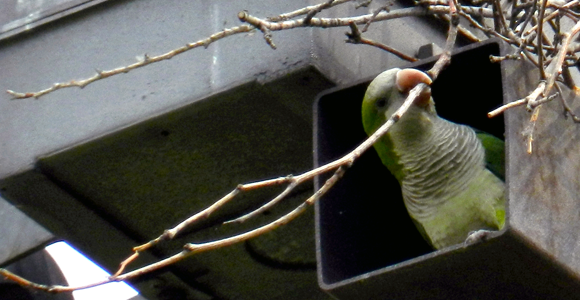 Where have all the parakeets gone? For more than 40 years, monk parakeets have delighted Hyde Parkers with their brilliant plumage and enviable survival skills. No one knows exactly when these pet-trade escapees began to breed, says ecology professor Stephen Pruett-Jones. The birds were first sighted in the late 1960s. The first nest, in what is now Harold Washington Park, was documented in 1979. But that nest is gone, along with the other nests in Hyde Park proper; the nearest colonies are in Washington Park and Jackson Park. More mysteriously, while the Hyde Park population has declined, the number of suburban birds is growing.